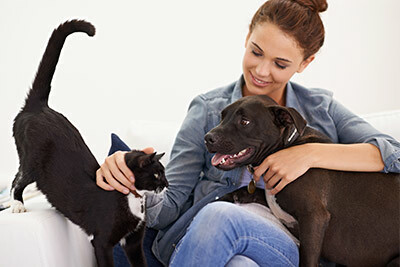 Owning a pet provides a number of healthy perks for the body, ranging from the potential for improved cardiovascular health to a reduced risk of asthma and allergic reactions in children exposed to pet allergens. Not to mention, wellness goes beyond the physical aspects, extending to psychological wellbeing—who hasn’t realized that cuddling with a furry friend truly feels good? Whether you’re more of a “dog person” or a “cat person,” rest assured, the time spent with your pet is an advantage. Here are some of the top ways your pooch or kitty is good for your health. One study from University of Missouri found that regular dog walkers lose an average of 14 pounds a year as compared to those without dogs. They’re more likely to get more exercise than non-dog walkers, and may lose more weight as a result. British researchers discovered dog walkers also tend to meet more people and make more friends. Neighborhood walks, games of fetch in the park, and even regular visits to the groomer or vet, all have a positive social effect among dog owners. Want to be in a better mood? Get a dog. New dog owners report feeling happier with their canine companion than without. Makes sense—when you’re greeting with love and affection each time you return home, it’s totally a mood booster. Pet ownership appears to be associated with a decreased risk of developing allergies in children in some communities, most notably in countries with lots of cats, like the U.S. Having a pet cat appears to provide a protective effect against developing asthma, too. One study, an analysis of over 4500 health records, showed that compared with cat owners, people who never had a pet cat were 40% more likely to die of a heart attack over the 20-year study period. They were also 30% more likely to die of any cardiovascular disease, including stroke, heart failure, and chronic heart disease.